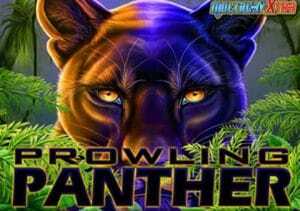 Prowling Panther is a 5 reel 720 ways to win slot game which was created by IGT. It is another MultiWay Xtra video slot that has been enhanced to be a little higher volatile than its predecessors. You can play Prowling Panther from just 50p a spin to as much as £1,500 a spin. It is set in the deep jungle with the panther being the main animal – it’s the top predator of the rainforest and hopefully will pounce to give you huge wins. Like other IGT slots, it is popular in land based casinos. You will notice that the 3 centre reels have stacked of 2x wilds which count as 2 symbols when forming part of a winning spin. It has an unusual hexagonal structure with pays going both left to right and right to left. The main attraction of Prowling Panther is the Free Spins Bonus feature which can be played when you see 3 or more Bonus symbols anywhere across the reels. Depending on how many bonus symbols you get, you will be rewarded with 8 to 96 free spins initially (this is because Bonus symbols appear stacked). The good thing is that you can get more free spins during the feature (by getting 3 or more Bonus symbols) – there’s up to 256 free spins available! The big wins will come from Stacked Wilds in the reels – the 2x wild stacks can give you huge wins as I managed to win over 610 times my stake on 1 occasion. Saying that, I normally tend to walk away with between 30 and 40 times my stake. IGT have released other MultiWay Xtra slots like Siberian Storm but Prowling Panther is a tad higher variance (which I prefer). I also quite like the panther so it’s appealing on a graphics level too. Saying that, I recommend Pharaoh’s Fortune (also by IGT) as this is a classic and still their best slot game to date in my opinion.